Why would you want to download and use WebKit nightly builds instead of Safari? Well, for most people, you wouldn’t. But if you’re a web developer, there are some gems in the latest WebKit that you’ll enjoy. 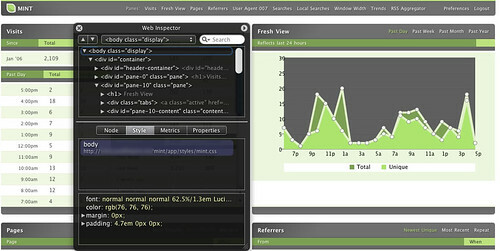 My two favorites are the new Web Inspector feature and SVG support. Below, you can see both of these features in action on my Mint install. The graph is done in SVG (something not supported in current Safari builds) and you can see the Web Inspector HUD.